Effectiveness of professional development is affected by the quality of social interaction. This study examines how online collaborative dialogues might influence teachers’ decisions in their classrooms—sometimes hurting when not appropriated well. This theoretical article extends principal sociocultural approaches to a cognitive concept called intersubjectivity through illustrations of empirical data. Part of a larger innovative professional development involving four classroom locations across Missouri, synchronous chatroom dialogues comprising teachers and researchers, and pre- and post-unit interviews underwent qualitative discourse and focused microanalyses. We argue that teachers purposefully used their dynamic intersubjective spaces and strategies in the management of meaning-making negotiations within an online interactive environment. The findings reveal two novel variable forms of intersubjectivity: (a) temporary suspension, and (b) resistance and disagreement. 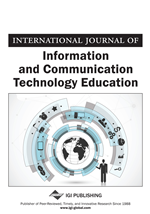 These findings inform teacher educators and practitioners of online learning about the cognitive and sociocultural processes and tension of learning within advanced interactive learning environments.